LibSVM is a C++ library that implements several Support Vector Machine algorithms that are commonly used in machine learning. It is a fast library that has no dependencies and most machine learning frameworks bind it in some way or another. LibSVM comes with a Python interface written in swig, but this interface is inherently slow as it does not take into account numpy's array structure. Also, it does not wrap all the library's functionality. Some projects bind it using this bindings and other (such as PyMVPA) make its own wrap, binding some methods directly to numpy's array structure. My approach was to code all algorithms that convert libsvm's data structures (sparse) to numpy arrays (dense) in pure C and wrap them in a very thin Cython layer. 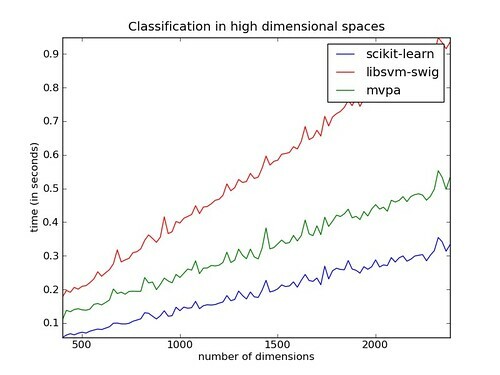 Special attention was given to minimize the overhead of converting between libsvm data structures and numpy arrays, as in my opinion this was the main source of bad performance in existing python bindings. As a first benchmark, I supposed a situation in which the dimension of the subspace is small and there are lots of points to classify. This is typically the case when your data is points in plane or in space and you want to draw the decision function by classifying every point in the grid. 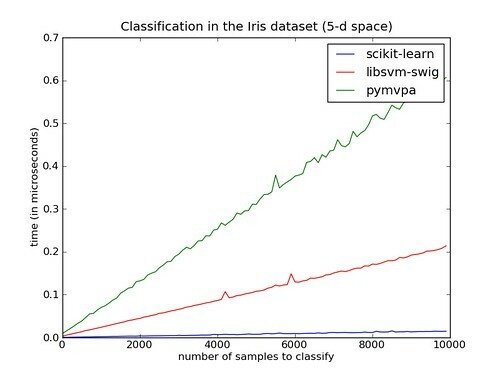 In this case, the bottleneck is not the classification algorithm, but the conversion of data from a dense representation used by python and numpy and a sparse representation used by libsvm. Not surprisingly, we get huge performance gains if we speed up the conversion dense/sparse. In the case of a huge number of dimensions, the speedup is not so spectacular, but we also get a performance boost by making training somewhat faster. In the benchmarks, a Linear Kernel was used, as it is the most common. Other more computationally intensive kernels would probably narrow the difference.